The Carmelite Sisters and staff at Santa Teresita’s Neighborhood of Care, provide professional and loving service as they meet the unique and individual needs of each person and each family. This compassionate care embraces not only the seniors who live at Santa Teresita, but also the family members who entrust their loved ones to us. The testimonials below reflect the experience of some of the Santa Teresita families and residents. Their stories will help you to better understand the quality of living and excellent care provided in our Manor Skilled Nursing and Good Shepherd Cottage Assisted Living. My Mom, Betty Martin, informed her children that she wanted to leave her current living situation to come to Santa Teresita and be with the Carmelite Sisters and a Catholic community. This was so important to her that we made it happen without further ado. She moved in with the first 7 residents and our whole family is rejoicing. Not only is this the best thing for Mom, but it has been a wonderful boost to the faith of our whole family. Thank you, dear Sisters. You have heard the call of the Lord to care for the elderly as they prepare for the greatest passage in their lives – heaven. We’re wondering if Mom is already there!! We chose Santa Teresita because both of my parents were Catholic, and we wanted to make sure that the spiritual well-being of my parents would be taken care of. We also chose Santa Teresita because of the level of health care provided by the Carmelites. On a scale of one to ten stars, I would give Santa Teresita twenty. I speak on behalf of all of my siblings when I say that our experience at Santa Teresita was outstanding. It was directed by God to have Mom and Dad go there- no doubt about it. When we first stepped onto the campus, before we even spoke with someone, we had a great feeling. The gardener smiled at us as we walked by, and other people took the time to look us in the eye and smile. We had a tremendous, tremendous experience. The presence of our Lord is truly there. To this day, we support the Carmelite Sisters as much as possible. My father, a vibrant, engaging, loving man, and a proud veteran of World War II, was a resident of Bethany and the Manor Skilled Nursing. Prior to living at Santa Teresita, he was living on his own and thriving until he was involved in a medical crisis that changed the course of his life, and the lives of us, his family members. After a very close call with death that left him impaired, it was apparent he could no longer live alone, and our family met the heart-wrenching dilemma many families are facing today: What do we do with Dad? For a variety of reasons, none of us could care for him without major disruption to our lives or families. When Dad was able to leave the hospital, we were led to Santa Teresita because he had volunteered there years ago, when his wife was hospitalized at the skilled nursing facility. It is never an easy decision to place someone you love in institutionalized care, and it’s a decision many more people will face in the coming years as the baby boom generation ages and our elders live longer. It can be a painstaking process to research, compare, and evaluate facilities, and the fact is, one is still taking a chance, even with all the homework they do. As we learned, a facility can be clean, beautiful, and new, but that does not necessarily reflect the level of care provided. In our specific situation, upon discharge, the hospital where Dad was admitted temporarily placed him in a for-profit facility, and the difference between that experience and the one at Santa Teresita was night and day. Santa Teresita has been our personal refuge in the turbulent storm of finding the best place possible for our dad. 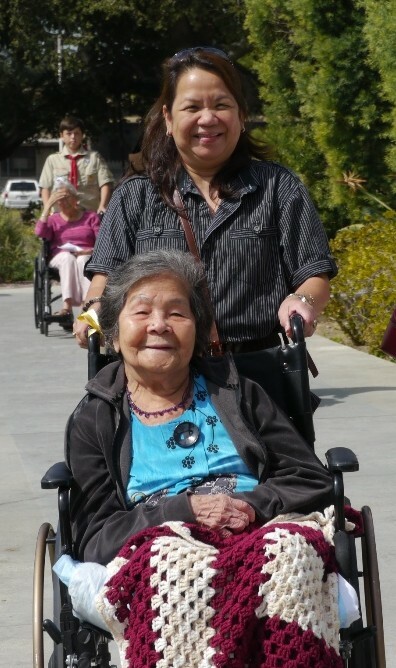 Perhaps the most important distinction that makes Santa Teresita so special is the belief system established there: To the Sisters, their work in caring for the elderly is a calling, not a job, and this philosophy transcends all levels of caregiving, from nursing staff, to food workers, to the maintenance crews. The Sisters provide an environment that, frankly, is unparalleled. While residents do not have to be Catholic, there is a special feeling and level of care provided that derives itself from the Sisters’ model being faith-based. This is evidenced in the sense of respect and level of care provided, which simply cannot be replicated in a for-profit environment. The Santa Teresita campus is lovely and brimming with gardens, and it virtually feels as though one is visiting a heavenly place on earth. Constant smiles from all staff, words of encouragement, and the conviction that every individual deserves to be treated with dignity set this very special place apart from others. Our father arrived at Santa Teresita extremely confused and fragile, but with the loving care of the Sisters and the Santa Teresita staff, he evolved once more into the vivacious and happy man we have always known. During his time at Santa Teresita, he emerged from the shell he was in, and had the opportunity to become part of the bell choir, to go on field trips, to play computer games geared toward improving memory or exercise, to attend the “senior” prom, and many more fun and enriching activities. He became part of a secure community of seniors who are treated with great love and deep respect. His caregivers, and the Sisters, were his friends, and literally an extension of his family. One of the most unique experiences in which Dad was able to participate is the cross-generational interaction with the Hayden Daycare Center, also contained within the Santa Teresita campus. Twice a week, he was shuttled to the center, where he tutored three- and four-year-olds in learning to write their names and the alphabet. He and the other residents also interacted with the children in a variety of programs held on the campus, including various holiday festivities. I don’t know if it was divine intervention that inspired this extraordinary idea, but it is a brilliant concept. One cannot begin to describe how the interaction between the generations benefits both age groups! The elders enjoy watching and engaging with the children, and the preschoolers are able to intermingle with the gentle and patient seniors, who share their wisdom and laughter. To some extent, this provides a re-creation of a type of nuclear family for many of these children, some of whom do not have stable family situations. It also provides an opportunity for the older generation to express and pass along their understanding of a value system that is not always predominant today. I can’t tell you how much Dad looked forward to this invigorating contact every week, and most importantly, he felt needed. This is a unique concept within the realm of elderly care. Dad also had two stays in the Manor Skilled Nursing facility, following two surgeries within his residency at Santa Teresita. This was the best possible transition for him: he was in familiar surroundings, given diligent care, was provided with excellent physical therapy, and was encircled with familiar faces to attend to him. We, his family, were extremely satisfied with the skilled nursing facility, and are grateful for the Manor’s presence and availability at Santa Teresita. Change for the elderly can be frightening and confusing, but these feelings are dramatically reduced when seniors know they are simply staying “next door” until they are strong again. We are now looking forward to the new “cottages” being built to provide the most cutting-edge facilities for the residents of Bethany. These will be beautiful residences, designed to operate as and feel like homes, which will further enhance the lives of the seniors. The Sisters have put great thought and dedication into making the Santa Teresita experience a model of what senior care should be in our society. As a family member, the best thing Santa Teresita provided for me was the confidence that Dad was not only getting excellent care, he was enjoying his twilight years, and living with people and caregivers who genuinely loved him. The decision to place one’s parent in a care facility will always carry a certain degree of guilt, but the Sisters have even helped to minimize these feelings in my life. I once asked Dad if he was happy, and his reply was, “I love my life here.” This is what every child wants to hear, and I think it sums up what the Carmelite Sisters are doing in our community: Taking care of and loving our seniors, treating them with dignity, and providing them with unique experiences to enrich their lives. My overall experience here at Santa Teresita has been like… home, because there are so many people around, and they’re just a part of me now. And we love the nuns! I mean, what’s not to love, you know?! I was living alone up in Petaluma, and that wasn’t fun. Here we get Holy Communion brought to us every morning. My favorite thing about living at Santa Teresita is the Activity, like Bingo! Selena and I love Bingo! And all the other activities! Sister Isabelle reads to us; in fact, she just read to us about St. Margaret of Costello, and I understand there’s a movie too. We’d like to see it. But actually, I should say, THE SISTERS – We just like having them around! At Avila Gardens, there was Sister Shawn Pauline who would come by and joke with us during BINGO… and trip us up! We like having a lot of Sisters around! They take us out to go see Christmas lights; we go for picnics in the park; we go to Walmart every other Friday, and Jim’s Burgers to get soft serve ice cream cones! The truth is, I’m comfortable here in my room, and I get the help I need – they’ll even wheel my Oxygen to the Pink Room for BINGO. I mean, what more do you want? What’s not to love about Santa Teresita?! I chose to come to Santa Teresita because they have nuns, and you don’t find that in many retirement places. I had been in Avila Gardens where Sister Shawn Pauline is, and I loved it there. That was my start with the Sisters. Then from Avila I went to Bethany, and then I came here. I’ve been very happy in every place I’ve been. It’s so convenient to everything. My overall experience has been very wonderful, very nice. As you can look around and see… it’s a great place! My daughter laughed at me today; we were going out to lunch and she said: “I don’t know WHY I take you out to lunch, you have such good meals here!” But they’re just wonderful here. They treat you well. Getting your meals and being taken care of is really important. My favorite thing about Santa Teresita is companionship, perhaps a combination of companionship and the food; really, the whole set up! It’s very peaceful here. We get together for breakfast, lunch and dinner. In fact, one of my daughters, Karen, is coming tomorrow night to help with the cooking! She loves to cook! I go to Mass here in the beautiful Chapel every Sunday. My family comes over and we go together to the 10:00 AM Mass. Some ladies get up and go to daily Mass! Our priest came here and heard Confessions the other day, which was nice. We all felt so holy! 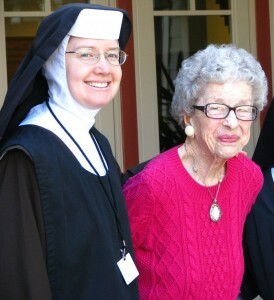 I originally met Sister Shawn Pauline at Avila Gardens. She was the first nun I met, and she was so good for me, for my children, and my grandchildren! She helped them all in her own way! She’s wonderful! And I’ve met quite a few Sisters since then. You know, I would tell people that Santa Teresita is a very loving, caring place, and something that you know you would be happy if you tried it.